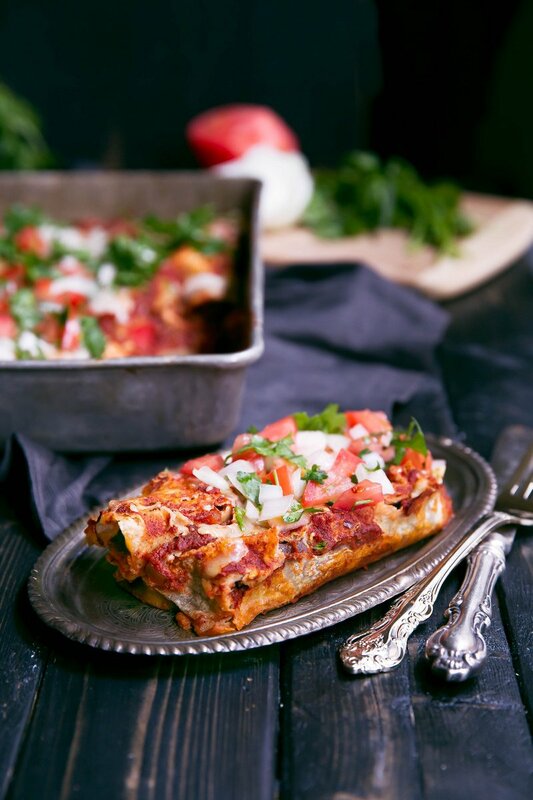 Enchiladas are known in my family to be the ultimate comfort food. I’ve grown up all my life eating them a variety of different ways: red sauce, green chile, a tomatillo salsa version, avocado and even sour cream. In my opinion, all enchiladas are worthy of eating. And shame on me for not giving you this recipe sooner! The first time I made this version, Sarah and I devoured these after a long day of photography and recipes. Our minds were teetering on the verge of delusional and delirious, but our bellies were happier than ever. Now that Tony’s home, he’s been craving home cooked meals. So far I’ve made him turkey meatballs, healthy chicken parm, pepper jack and chicken pasta and finally, these beautiful enchiladas. He’s an athlete so I have to make sure that my recipes are both satisfying, filling and tasty. Most of the time, he is never able to tell that my recipes are lightened-up or healthier versions of his favorites. These enchiladas were no exception. Chicken breast instead of rotisserie chicken: we bake the chicken first, then shred it. It’s easy and you don’t get the added calories + fat that your average store bought rotisserie chicken does. Just a little bit of cheese: I didn’t go crazy on the amount of cheese in this recipe. Frankly, it isn’t necessary thanks to the wonderful creamy beans and flavorful enchilada sauce. Major win. 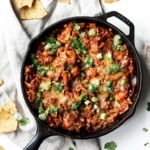 Refried beans: I love, love, love using refried beans in my enchilada recipes because of the added nutrition, fiber and protein. Plus it makes the enchiladas literally melt in your mouth. Homemade enchilada sauce: this is the most exciting part of the recipe. Making your own enchilada sauce is easier than you can imagine. Just tomato sauce, garlic, onions and a few spices. You are going to be making it again and again! And best yet, it cooks while your chicken breast is baking so you get two things done at once. 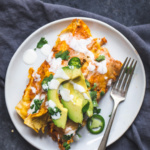 These enchiladas are a healthy complete meal and can please any sort of crowd. You are also welcome to use small whole wheat tortilla instead of corn. I personally just love the way corn tortillas taste with the other flavors but it’s up to you. I hope you love these enchiladas as much as I do. If you make this recipe, be sure to leave a comment below or tag #ambitiouskitchen on Instagram! Amazing and healthy chicken enchiladas with creamy refried beans, cheese & a homemade enchilada sauce. This recipe is a dinner staple! Preheat oven to 400 degrees F. Line a baking sheet or large pan with foil and spray with nonstick cooking spray. Set aside. While the oven to preheating, prepare the enchilada sauce by heating oil in a medium saucepan over medium high heat. Add in garlic and onions and sauté for 5 minutes or until onions become translucent. Add in chili powder, cumin, oregano and cayenne pepper and stir for 30 seconds to allow the spices to cook a bit. Stir in tomato sauce and water, then bring to a boil. Reduce heat to a medium low and simmer for about 20 minutes. 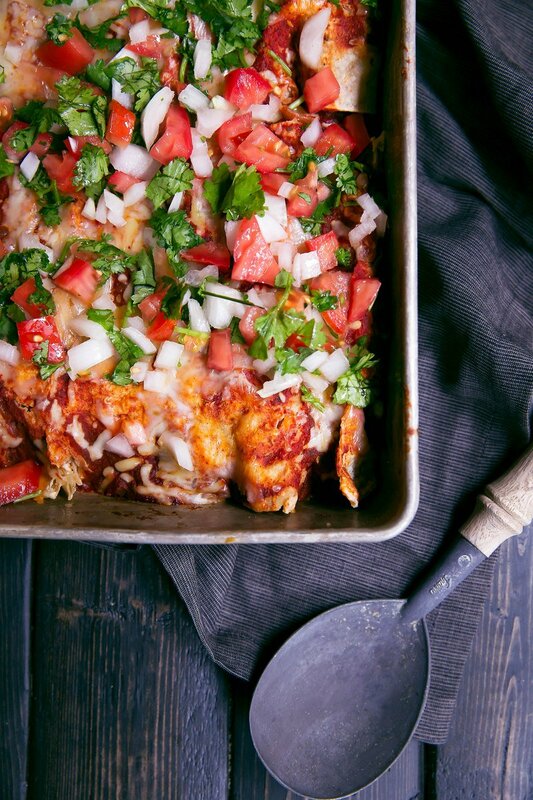 While enchilada sauce is cooking, place chicken breasts on prepared baking pan, season with salt and pepper and bake for 15-20 minutes or until chicken is cooked completely and is no longer pink. If your chicken breasts are on the thicker side, this may take a little longer than 20 minutes. It’s always best to test with a meat thermometer to ensure they are fully cooked. Once done cooking, shred chicken with two forks. 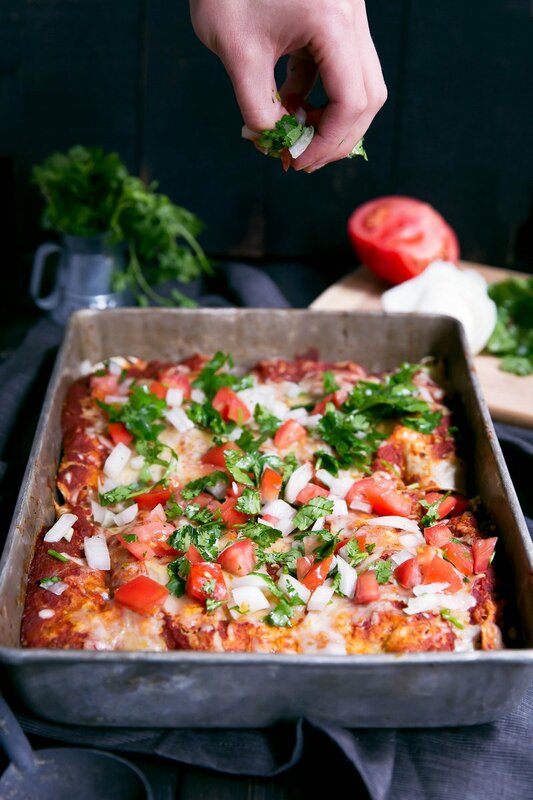 To make the enchiladas: Prepare enchiladas by spreading ¾ cup of enchilada sauce on the bottom of a 9x13inch baking pan. 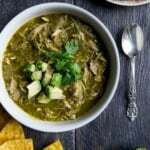 To assemble enchiladas, place 2 tablespoons of refried beans in a corn tortilla, then top with a few tablespoons of shredded chicken and about 2 tablespoons of enchilada sauce. Roll tortillas up and place seam side down in pan. Repeat with remaining tortillas. Next pour remaining enchilada sauce over the top of the tortillas and sprinkle with cheeses. 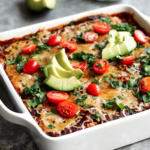 Cover pan with foil and bake enchiladas for 25-30 minutes. Remove from oven and allow to cool for 5 minutes before serving. Garnish with onion, avocado, tomato and cilantro, if desired.Makes 6 servings, 2 enchiladas each. 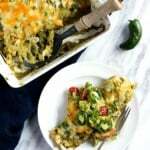 42 Responses to "Skinny Refried Bean & Chicken Enchiladas with Homemade Enchilada Sauce"
This looks incred, girl! Bikini friendly food never looked so good! Oh wow these look yummy! Making these for Josh would win me a lot of brownie points! He’s obsessed with enchiladas! I’d just take out the chicken in his! oh my gee this looks amazing. If I see anything amazing on Instagram I will also tag Ambitious Kitchen. This looks like exactly what I’m craving at the moment. The enchilada sauce alone would be such an amazing condiment to have around! Yes, it’s the best! 🙂 Hope you love the enchiladas! yum yum yum. MAKING THESE. YUM! I’ve seen enchiladas that look SO SO GOOD! These look even better! We made these last night and gosh. I can’t even explain how AMAZING they were. Thanks for the recipe! These were sooo soooo soooo delicious! I am adding them to my dinner recipe rotation. They are super filling and we managed to stretch them for 3 days, which never happens because my husband and I are both big eaters. I am such a lover of enchiladas especially when they are on the healthy side. I did however make these for my family the other night and i think they thought i was trying to kill them with the amount of chilli powder. I possibly think your measurements of 3 Tablespoons is wrong? I would recommend for anyone trying this to maybe only put 1-2 teaspoons of chilli. If you’re making homemade enchilada sauce then I do recommend at least 2 tablespoons. also could be the chili powder you are using? Some are stronger then others. Which brand did you use? These look delicious! What size of tortillas did you use? I used small corn tortillas 🙂 I believe they are about 6 inches. Just made these tonight for dinner and LOVED them!! They were soo good and you were right I will never buy enchilada sauce again this sauce was easy to make and had the best flavor I have ever tasted!!! Thank you!! That’s amazing!!! 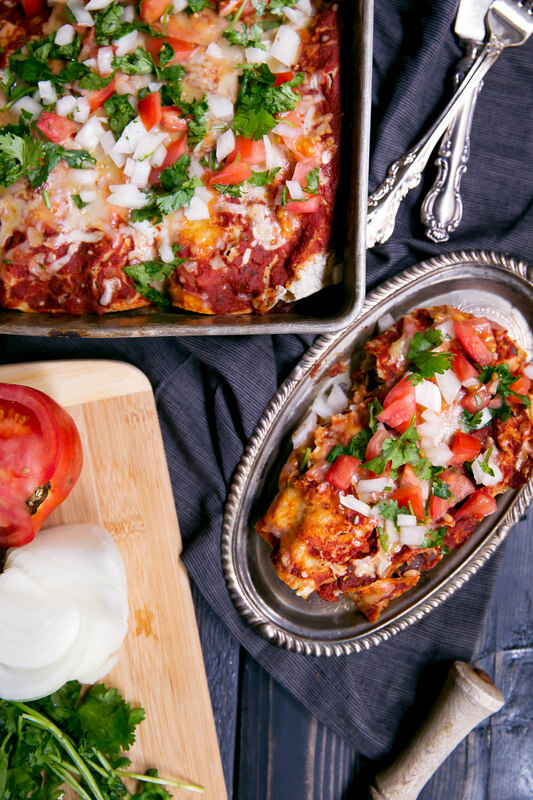 Love these enchiladas and I definitely need to remake them soon! I don’t use corn tortillas very often, and while I’ve made this recipe a few times, I’ve always just used flour tortillas. Should I be cookin the corn tortillas first (in a pan) or can I use them as-is from the package? Just assembled for dinner tonight, Love your recipe for enchilada sauce, especially on turkey pepper jack stuffed meatloaf. Will NEVER buy enchilada sauce again. Thank you! These were awesome!!! I even changed someone’s mind who said they didn’t like enchiladas. The sauce is outstanding – i have already shared the recipe. I actually made mine with ground beef, because that is what I had on hand. I will definitely be trying again with chicken, and know they be equally as fabulous! 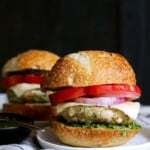 I just made these and can’t wait to put them together for dinner tonight! I added more chicken and beans, and I used La Banderita low carb tortillas. It was a little more labor intensive than I remembered, but I’m sure it’ll be worth it. YUM. I made these tonight and they were BOMB!!! I used Xtreme Wellness whole wheat tortillas and stuffed them into 8 enchiladas and just reduced the cheese by half (added the cheese to the filling instead). Per Myfitnesspal, 452 calories for a huge plate of food – I LOVED these! Thank you for the recipe! Dying to try these, we have fat free cheese, sour cream and refried beans, as well as low carb tortillas as we have high cholesterol. I didn’t see cholesterol listed, and will probably have to figure it out as I cook it all up, however, do you happen to know the cholesterol in the nutrition information? I hope you get a chance to try them! I don’t have the cholesterol nutrition info on-hand, but you could definitely find it if you search the cholesterol in the ingredients you end up using! We were just told that my husband has to give up red meat. This is a big deal for him. 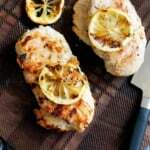 I have been racking my brain to come up with healthy, tasty meals with turkey especially because I make chicken meals alot but have found a twist on some of mine on here.So far these turkey recipes sound the best. I have printed a few and am excited about trying them. Thank you!! Such a great recipe. My only, “uh oh”, was that the chili powder I used was so hot (they really do vary by brand) and was so hot…we couldn’t even eat them. So…I made again and altered the amount of chili powder and they turned out perfect. Such a great recipe, thank you!